Solar Electricity is the conversion of the sun’s energy in to electricity. This is done using panels that contain photovoltaic cells, often referred to as Solar PV. These cells produce an electric charge when the suns light shines on them. It is the light not heat that is used to create the electricity and as long as there is some light the panels will produce electricity. The amount of energy will vary with the strength of the light, so whilst they work best on a bright sunny day they will also still produce some electricity on a cloudy day. currently most panels are in the 200-250watt peak range. 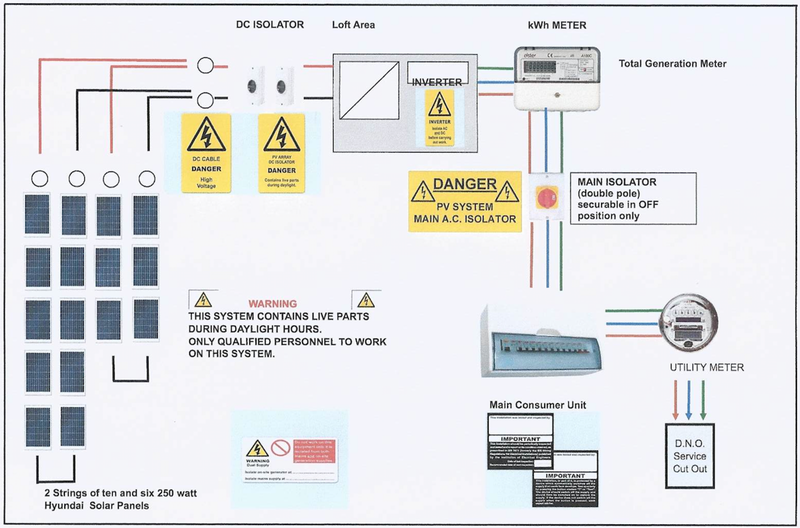 so for the maximum size under the domestic feed in tariff of 4KWp ( 4000 watts) you will need around 16 panels. you can get lower capacity panels and would obviously need more of them for the same total. It is also possible to get high capacity panels up to 375 watts but they are at a price premium. The different panels vary in exact size but the majority are roughly 1.5m by 1m in size. A kilowatt is a measure of power, or how fast something is using or generating. You will see the power of electrical items listed in kilowatts or watts ( 1000watts= 1kw). an electric heater might be 1kw and non energy saving light bulbs were 100watts. You will see the size of a solar electricity system measured in KWp or Kilowatt Peak. As the amount of electricity generated by the panels varies with the amount of sunlight they are rated at their maximum or peak output. So with a 250watt panel the maximum power it will generate in strong sunlight is 250 watts. Kilowatt hour or Kwh is a measure of energy and the unit in which electricity is measured in for billing purposes, both the figure you pay to import electricity from the grid and also the amount you get in feed-in-tariff. a kilowatt hour is one kilowatt of electricity for one hour, or to think of it another way if you have a 1 kilowatt electric fire and have it turned on for 1 hour that will have used 1KWh or electricity. 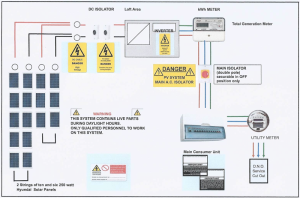 A solar panel system consists of a number of solar panels, linked together like a battery. These produce DC electricity again like you get from a battery. The electricity in the home is AC electricity so the solar panels feed a unit called an inverter that converts the High voltage DC electricity into 230v Ac as used in the home. This is then fed in to the electricity supply in your home through a meter to record how much you have generated. There will also be some switches to allow you to turn off the ac and dc feeds. The electricity from the Solar Panels is fed via the inverter into your houses electricity supply. If you are using electricity in you home this will be used first before anything coming in from the national grid. On the other hand if your system is generating 3kw and you are only using 2kw then all the electricity used in the house will be provided by the solar panel system for free and the surplus will be exported back to the national grid. For every KWh or electricity generated you will receive the feed in tariff guaranteed for the next 20 years.